This is a quick guide to deploy your trained models using Microsoft Azure Functions. This guide will upload a trained image classifier to Azure Functions. The inference function will be triggered by a HTTP POST request method call that includes the URL of an image that is to be classified. The result of the prediction will be returned in the HTTP Response. 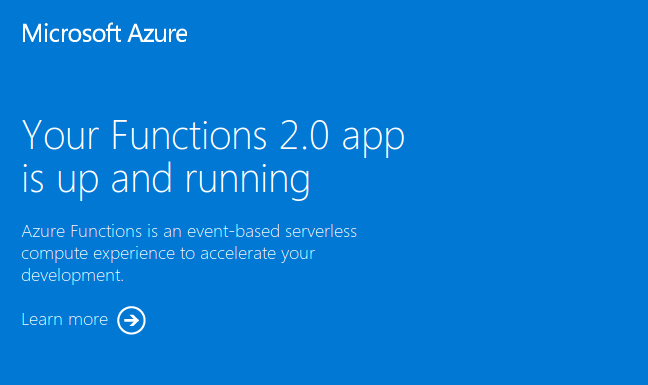 Microsoft Azure Functions is the serverless architecture that Microsoft offers. You don’t need to provision the servers or maintain the OS, but just need to upload your code and define any packages it depends on. Microsoft Azure offers two kinds of pricing, Consumption plan and App Service plan. The main difference is that the Consumption plan allows you to pay only when your function runs. It will scale the architecture for you if needed but you don’t have any control on how it scales. See here for the Consumption plan pricing. With the App Service plan, you can pick the level of computing resources that you want your function to run on. You are then charged for as long as your resources are defined, regardless of whether your function is running or not. See here for the App Service plan pricing. Currently, python is still in preview stage in Azure Functions and fastai only works when you provide your own custom Docker image on the App Service plan. Replace <PROJECT_DIR> with your own project directory name. Create an Azure Function Project that uses the Python runtime. Create a function with name using the template "HttpTrigger". Replace `` with your own function name. func new --name <FUNCTION_NAME> --template "HttpTrigger"
Install fastai and any other dependencies your app needs in the virtual environment. Then output all the dependencies to requirements.txt which will be used when you build the Docker image. This is where your inference function lives. The following is an example of using a trained image classification model, of which you use to replace the default file. Copy your trained model file, export.pkl, to . You should see be replaced with the class that your inference function predicts. You can press Ctrl+C to stop the testing when you’re ready. docker build --tag <DOCKER_HUB_ID>/<DOCKER_IMAGE_NAME>:<TAG> . You app in the Docker image is now running at the URL: localhost:8080. You can run the same tests in Check Test Outputs with the new URL and you should see the same test output as before. Use the following command to log in to Docker from the command prompt. Enter your Docker Hub password when prompted. You can now run the following commands to create the Azure resources necessary to run the inference app on Azure Functions. The following example uses the lowest pricing tier, B1. The following assumes the Docker image uploaded earlier in your Docker Hub profile is public. If you have set it to private, you can see here to add your Docker credentials so that Azure can access the image. After the previous command, it will generally take 15-20 minutes for the app to deploy on Azure. You can also see your app in the Microsoft Azure Portal under Function Apps. You can run the same tests in Check Test Outputs with the new URL and you should see the output as before. When you are done, delete the resource group. Remember that with the App Service plan, you are being charged for as long as you have resources running, even if you are not calling the function. So it is best to delete the resource group when you are not calling the function to avoid unexpected charges.